SolBid has provided consistent coverage of the ITC Solar Tariff Case as it has evolved over the past four months. In August, I reported on the “proposed” solar tariff submitted to the U.S. International Trade Commission by Suniva and SolarWorld America, two U.S. based but majority Chinese and German-owned companies (respectively), to impose a tariff and floor price on imported crystalline silicon photovoltaic solar panels of $0.40/watt and a floor price of $0.78/watt. In September, I covered the “possible” solar tariff, as the International Trade Commission heard arguments on both sides, and decided whether or not to find favor with Suniva and SolarWorld’s petition. Now, it is time to return to the case once again, as the ITC has just issued recommended remedies based on the requested tariff. The four commissioners proposed a variety of remedies, though none as stringent as the floor prices proposed by the petitioners. The commission suggested that each the remedies remain in place for four years — the full timeline under Section 201, although there is an option to extend them an additional four years. ITC Chairman Rhonda Schmidtlein, a Democrat appointed under Obama, was perhaps the most severe in her proposed remedies. She proposed a combination of tariff and quotas on cells, with a rate of 10%, and set the first-year quota at 0.5 GW (500 MW). On imports past the 0.5 GW limit, the commissioner recommended a 30% tariff, which would be "incrementally reduced" as the quota is raised. 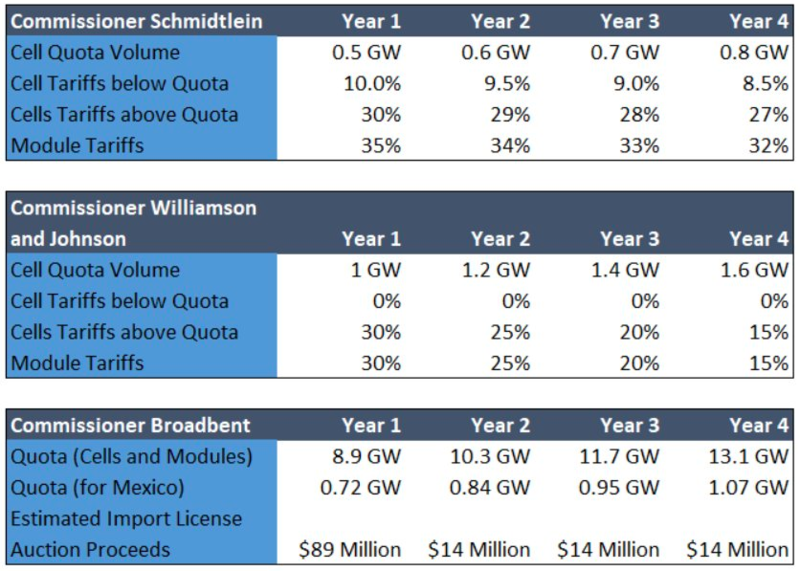 For modules, Schmidtlein proposed the highest tariff to date, with a 35% rate that would be reduced over the four-year span. Commissioners David Johanson, a Republican appointed by Obama, and Irving Williamson, a Democrat appointed by President George W. Bush, aligned on the proposal to place a 30 percent ad valorem tariff on modules, to decline by 5 percentage points per year over four years. For imported solar cells, the two commissioners agreed on four-year "tariff-rate quota" that would allow for up to 1 gigawatt of tariff-free cell imports. Any imports over 1 gigawatt would be subject to a 30 percent tariff. Commissioner Meredith Broadbent, a Republican appointed by Obama, offered the least severe remedy, proposing to cap imports at 8.9 GW per year, and increase that amount by 1.4 GW in the four-year span. Broadbent also proposed that the president administer the quota by selling import licenses at public auction at a minimum price of 1 cent per watt. In other words, the importer of record would have to pay a penny per watt to come in under the 8.9-gigawatt restriction. The sale of import licenses will likely generate revenue for the U.S. government of at least $89 million in the first year, to increase by at least $14 million each year thereafter. But neither Suniva, nor SolarWorld Americas found favor in the proposed remedies. "Suniva calls on President Trump to implement the remedy recommendations as submitted by Suniva and SolarWorld, reject the ITC’s weak remedy recommendation, and take the courageous steps necessary to save American manufacturing with a strong remedy that will reinvigorate this sector, and help protect U.S. energy security and economic prosperity," the company said in a statement. Juergen Stein, CEO and president of SolarWorld Americas, indicated he is also looking for a more favorable response from the White House: "We are pleased that a bipartisan majority of the commission has recommended tariffs, tariff-rate quotas and funding for the domestic industry. This is a useful first step," he said. "The process will now move forward to the president, and we continue to believe that the remedies SolarWorld has recommended are the right ones for this industry at this time." In a case that has drawn lines in the sand with respect to the U.S. solar industry, a number of other major solar companies have come forward to weigh in on the decision. But another large U.S. solar company, SunPower, could be badly hurt by the final outcome based on the panel’s ruling, according to its chief executive, Tom Werner. Werner said his firm spends about $100 million annually on research and development in the United States, and would have to cut into that budget if tariffs are imposed. “What you have is two companies that failed to compete in the marketplace that now are going to get support from companies that succeeded,” he said. Finally, in a sign of the truly polarizing nature of this case, acclaimed Fox News host and Trump supporter Sean Hannity recently came out against the Section 201 petition. In a scathing radio spot that's also been shared as a video, Hannity claims that Suniva and SolarWorld—two foreign-backed companies—are seeking to "manipulate U.S. trade laws" in order to get a "bailout" from President Trump. By Nov. 13, the ITC will send its final recommendations to President Trump, who can follow their suggestions, impose his own set of remedies or do nothing. It's highly likely Trump will take action, given his protectionist preferences and open disdain for solar energy.